The trade show of New Europe, Conventa, awarded Ljubljana with two prestigious certificates of excellence for the best meetings destination in the L - Category of cities that can host up to 2,000 congress guests. The Meetings Star Award is an award for excellence in congress tourism, which is a result of strategically planned and harmonized collaboration of congress tourism providers. 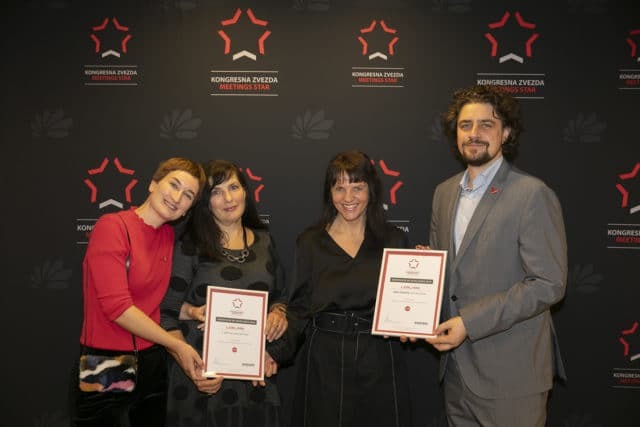 The winners in each category for Meetings Star Awards, conferred by Kongres Magazine and Conventa Trade Show, were announced at the Meetings Star Award ceremony that took place on 22 January 2019 in Cankarjev dom – Cultural and Congress Centre Ljubljana on the opening night of Conventa trade show. Slovenia’s capital was with the score of 4.35 (between 1 to 5, where 5 is the highest score) twice ranked among the best finalists: firstly, in the L – Category of the best meeting destinations, and, secondly, in the category of the Best Meeting destinations in New Europe. In the L – Category, in which the destinations that can due to its congress infrastructure and aviation links host up to 2,000 congress participants, Ljubljana was ranked as the 3rd in the category (following Zagreb and Tallinn, respectively). In the category of the best meeting destinations in New Europe, Slovenia’s capital shared the 6th place with Budapest. The certificates were Both of the certificates present a special recognition of the development of Ljubljana and Slovenia as congress destinations. In 2018, the Meetings Star Award, together with Conventa, celebrated its 10th anniversary. Throughout its years of existence, the Meetings Star Award has become among the event organisers and professionals recognisable as one of the few awards that has been awarded on the basis of professionally established standards and criteria. The international expert jury of 12, evaluated many of Europeans congress destinations, and placed them in four categories, based on the number of participants that they can guest, without any logistical or organizational problems (category XL – more than 2000 guests, L – up to 2000 guests, M – up to 1200 guests, S – up to 600 guests) and added a category of the Best Destinations in New Europe.